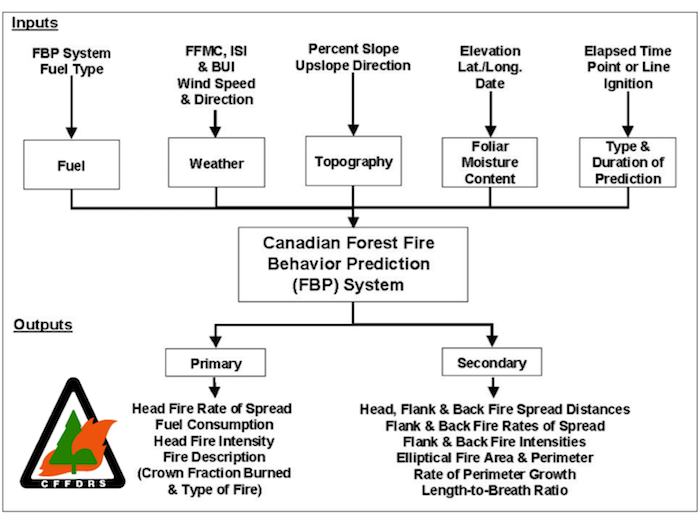 This flowchart highlights the basic inputs and outputs for the FBP system, demonstrating many similarities to the US tools provided to support fire behavior prediction. However, there are significant differences. Most important are the way that weather (fuel moisture and wind) and fuel (fuel types) are applied. The ISI and BUI, drawn from the daily FWI system and adjusted for local conditions, are used directly as wind and fuel moisture inputs in fire behavior calculations. 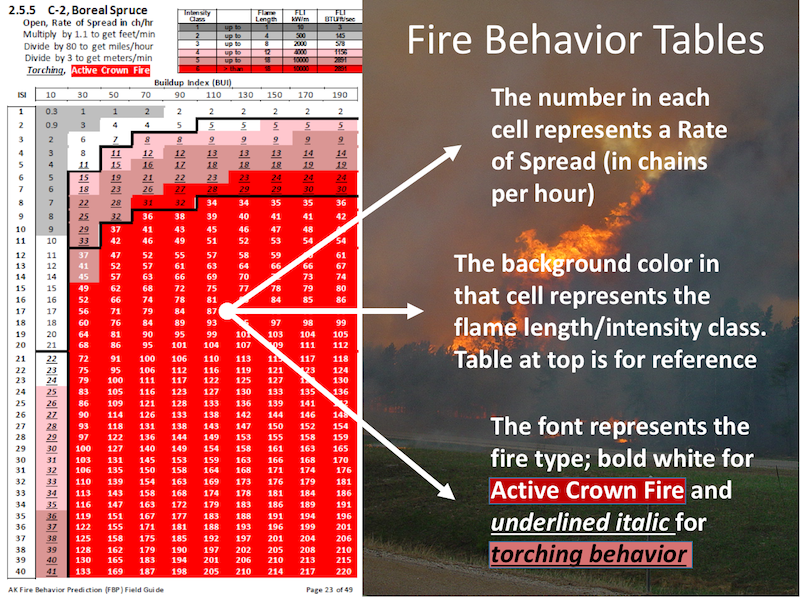 This facilitates the use of RAWS observations in fire behavior estimation. Designed specifically for use in predicting the full range of fire behavior in northern forest ecosystems, there are 18 fuel types among five fuel groups. The classification recognizes coarse vegetative cover and structure types. Each CFFBP Fuel Type integrates the surface and canopy fuel characteristics, providing for evaluation of crown fire initiation and propagation without additional canopy characterizations. An Excel workbook for comparing fuel types is available for download here. These fuel types represent the most important fire potential throughout the boreal forest. C-2 (spruce) and C-4 (pine) represent extreme potential with active crown fire anticipated under most conditions. 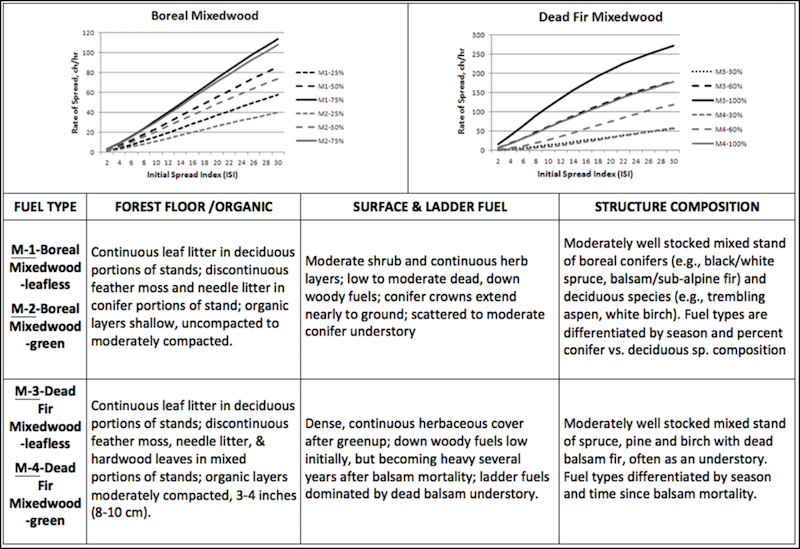 C-3, C-5, and C-7 represent more moderate potential with taller trees and higher surface to canopy gaps. These two grass fuel types are intended to differentiate between spring grass fuel beds (O-1a after snowmelt and late summer cured grass fuelbeds (O-1b). Their use requires characterization of the curing level in the grasses. They can be used for flammable grass/shrub fuelbeds, though generally require lower curing levels to properly slow spread rates. 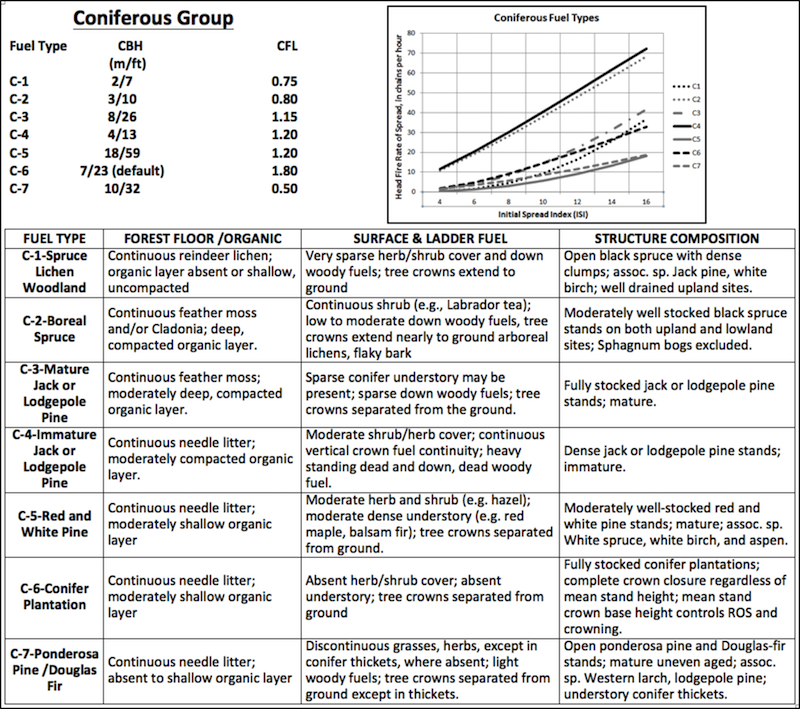 Common to the Boreal Forest, these fuel types represent areas where varying combinations of conifers and hardwoods can support a range of crown fire potential ranging from torching trees to active crown fire. 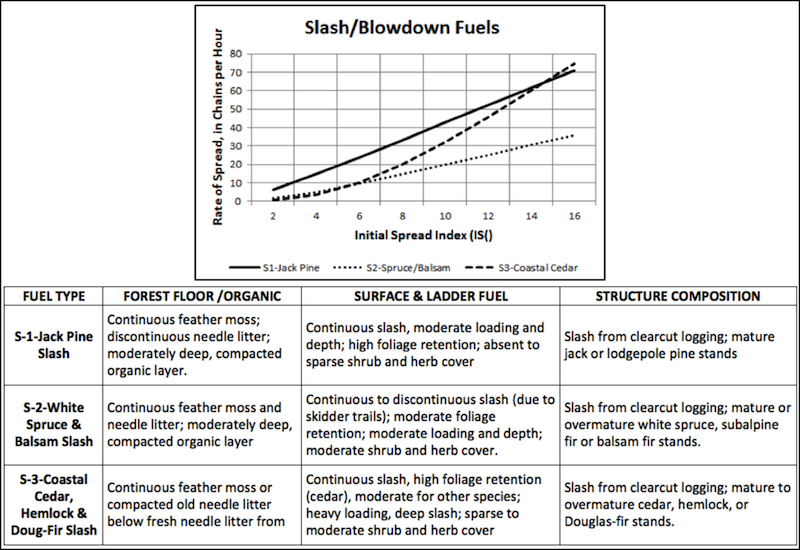 Use of these fuel types usually require assumption of the conifer percentage in the canopy fuels. These fuel types were calibrated to largely pure stands of Trembling Aspen and/or Paper Birch. They may over-estimate potential in northern hardwood stand of the eastern U.S. and underestimate potential in oak dominated central hardwoods of the eastern and central U.S.
Calibrated to post-logging fuelbeds with substantial fuel loads, they may or may not effectively represent blowdown areas. FBP Lookup tables can be found in the Field Guides (AK, MI, MN) that can be downloaded at the links below or at the top of the section. This example shows that spread rates, flame lengths, and fire type can be determined once the user has identified the fuel type, the ISI, and the BU( or grass curing for open types.